We are expanding our selection of monitors with the New RainbowHD SBL from Transvideo. For those unfamiliar with the brand Transvideo has been designing professional displays for the motion picture industry since 1985. You will often see their monitors mounted on Steadicam and Shoulder rigs because of their Avenger Leveler and bright screen. 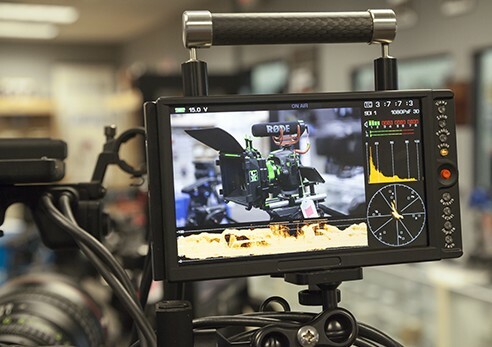 The super bright 7″ Rainbow HD from Transvideo is one of the brightest monitors we’ve seen. At an impressive 900Nits Transvideo has created a masterpiece with their new Rainbow HD SBL. This bright versatile monitor can easily change it’s view to best suite the Job you are performing with it. This monitor was built to be a workhorse on set while still being lightweight, slim, and rugged. Measuring only 7.5 x 4.1 x 1.4 inches the monitor’s housing is built from machined Aluminum and is fully sealed with no holes or vents. This Monitor also does not does not have any fans to produce noise. Physical buttons down the right side makes it easy to use the job specific “Views”. This Monitor has anti-reflective glass to aid in viewing while on set and to lessen the need for a monitor hood that limits your angle of view which can be viewed at ±80° H & V. High-quality connectors supply the monitor with 3G HD/SD SDI, HDMI, and CVBS. Consuming 16W nominal power this ultra-bright monitor is powered Is supplied from 10 to 36V DC through XLR4 from A/C or batteries like Anton-Bauer (which allows the monitor to read the remaining battery in percent) and accept IDX V-Mount Like the new DUO-150. Although this Monitor has a rock solid housing, quality inputs, and a brilliantly lit screen it’s whats on the inside that really counts. The Rainbow HD does not disappoint with great features like Anamorphic desqueeze allow you to view footage “normal” without distortion. This monitor also works as an HDMI to SDI converter great for those using off-camera recorders Like the AJA KiPro 4K/QuadHD/2K/HD. Calibrated from the factory and loaded with color Profiles the Rainbow HD is suited to work with several different camera types. Multiple “views” allow for quick display changes optimized for certain jobs while on set. Below is a summary of each “View” with the task it is optimized for as well as an explanation of the features preset to each. Focus Puller View: This view is designed to minimize distractions to a Focus Puller. With no status bar or overlays the Focus Puller has a clear view of the frame. Features like the Focus Helper and Peaking can be easily added by pressing the action buttons on the side, this allows the User to focus at the task at hand. Operator View: The Operator view is designed to give essential operation information like on-air Tally light, power supply voltage reading, and Battery Levels for Anton Bauer only. This view is kept clean just like the Focus Puller view except the addition of the status bar. Waveform View: The waveform monitor allows users the ability to see the Luminance Waveform information as an overlay. This simple function is designed to give minimal information but is very useful while working on projects where light values matter. A great example for this would be to use the waveform to make sure you’re between 45-50% for Green screen. In Waveform view the Timecode, Tally light, and power info are included in the Status Bar. DIT View: This view gives critical information on the media being fed through the monitor to a Digital Imaging Technician (DIT). This includes; waveform, vectorscope, and histogram. The monitor also allows the DIT to see the battery level, source, timecode, tally, resolution, framerate, and Audio levels. This is by far the most informative view and the best way to make sure all information that is needed is being captured properly and without interference. Body-rig View: This view is designed to be used while the monitor is rigged on a shoulder rig or Steadicam. It comes with an Avenger Leveler system on the top status bar display as well as an on-air Tally, battery level, and reading from power supply in volts. This helps camera operators know when their camera is recording if controlled remotely. All Features are activated and modified off of a simple principle. Toggle the function on or off by quickly pressing the buttons next to the screen. To adjust the parameters of the function you hold down the same button for a few seconds until the function settings pop-up. Zoom and Desqueeze Modes: Transvideo has three different Zoom Modes. One mode is Pixel to Pixel or 1:1 zoom to maintain integrity of the resolution Transvideo does not zoom beyond (1:1). The second mode known as desqueeze or Anamorphic Zoom is designed to allow 2.39:1 aspect to be used while at the full height of the screen while cropping the sides. To view areas within the cropped portion of the fame you can use the Red Joystick located on the right side of the screen. The third version of the Focus modes is the Custom Focus Mode, which allows you to position the zoom anywhere within the frame. This is useful when using ARRI Alexa in 4:3 mode. Peaking: For those who don’t know Peaking is a function that highlights along contours on an image making it easier to focus. Peaking on this monitor can be adjusted for sensitivity. Focus Helper: Focus Helper is a function that assign’s colored dots to focused areas of the screen. This is extremely helpful while you can alter the level for this feature or the color in which the dots are displayed. This is very close to the traditional type of peaking you would normally see. You can adjust sensitivity and color for this function. Markers: The Transvideo Rainbow has several markers for allowing you the option of overlaying these guides to your frame. The Central Cross marker is separated from the Safe Area markers and can be used independently. Safe area can be adjusted from 50 to 99%. The markers can be quickly changed and come in the following ratios: 1.33:1(4:3), 1.56:1(14/9), 1.78:1(16/9), 1.85:1, 2.39:1. Colorimetry: D65, D56, FB (full bright), D65 adj., D56 adj. Virtual horizon: Is a great tool for users who are using the monitor while mounted to a shoulder rig, or steadicam. This extremely accurate Level ensures your camera is being held level, this is useful while on location and if your environment is disorientating. After having some time to play around with this monitor we found it extremely intuitive and easy to work with. View selections were simple and modifying them was just as easy. The Transvideo RainbowHD SBL is solid in feel and performance. With the RS3 cable and included Color profiles this monitor is a wonderful companion for your ARRI ALEXA. This monitor is not limited to ARRI, And has profiles for Canon Cinema cameras and many more.